Lemon zest and fresh rosemary add a flavorful twist to this just-sweet-enough quick bread (recipe here). Zucchini bread recipes are a dime a dozen, but this Lemon Rosemary Zucchini Bread really stands out from the crowd. This is not a savory quick bread, but it calls for less sugar than many zucchini bread recipes, along with some whole wheat flour and olive oil, so it doesn't feel like you're eating cake for breakfast. (Not that there's anything wrong with eating cake for breakfast.) It also makes a delicious afternoon snack. The flavors of the rosemary and lemon are pleasantly subtle, but you can bump them up if you like. This bread tastes even better the next day, will stay moist for several days, and freezes well. I like it best thickly sliced, toasted (I use a little toaster/convection oven), and slathered with butter. Enjoy! P.S. 100% Whole Wheat Coconut Zucchini Bread (made with unsweetened coconut) and moist and healthy 100% Whole Grain Carrot, Raisin, and Zucchini Bran Muffins (made without bran cereal). © FarmgirlFare.com, where we are way down on our zucchini—and zucchini bread—eating quotient for the year. I'm so happy that the pretty little fruits on my two big Sun Sugar cherry tomato plants have finally started to ripen because this Greek Style Panzanella Salad is one of my favorite summer recipes. 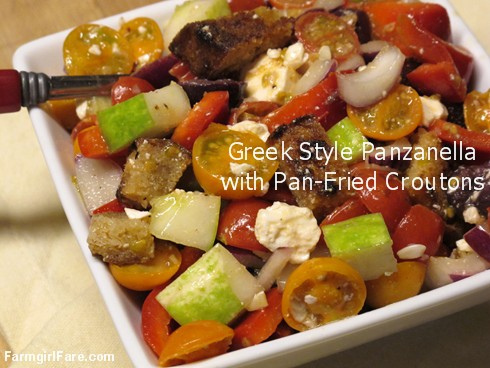 I'd never been a fan of panzanella, which I always thought of as soggy bread salad, until a few years ago when I came across Ina Garten's Greek style version. It makes a great side dish for grilled meats and a perfect light supper or lunch. I've even eaten the leftovers for breakfast. To make it more substantial, try stirring in some organic garbanzo beans. Enjoy! P.S. Easy Italian Countryside Raw Tomato Pasta Sauce with basil, capers, and olives and Greek Salad Pita Bread Sandwiches with baby spinach and quick kalamata olive tapenade. © FarmgirlFare.com, where the kitchen garden tomatoes are even better late than never. One of the best things about writing Farmgirl Fare for the past ten (!) years has been making friends and meeting so many wonderful people from around the world. 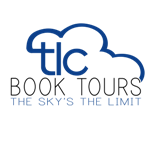 I was already a huge fan of Judith Ryan Hendricks' Bread Alone and The Baker's Apprentice when Lisa Munley at TLC Book Tours contacted me back in 2009 to see if I was interested in being part of a tour for Judi's new book, The Laws of Harmony. Of course I jumped at the chance (and loved the book), and Judi and I have been great friends ever since, emailing back and forth and chatting on the phone every couple of months for hours at a time—mostly about food. Judi, who lives in Santa Fe with her husband Geoff and dog Blue, has a degree in journalism and worked as a journalist, copywriter, computer instructor, travel agent, waitress, and baker before turning to fiction writing. Her first novel, Bread Alone (so named because she's a fellow Daniel Leader fan), was a national bestseller and a BookSense 76 pick. It was followed by Isabel's Daughter (which I also love), The Baker's Apprentice (book two in the Bread Alone series), and The Laws of Harmony, which was nominated for The Santa Fe Reporter's "Best of Santa Fe." Her work has been translated into 12 languages and distributed in 16 countries. Bread Alone is the story of thirty-one-year-old L.A. executive wife Wynter Morrison, whose upper class life is turned upside down when her husband announces one evening that their marriage is over. Emotionally devastated and desperate for a change of scenery, Wyn escapes to Seattle and takes a job as a bread baker, rekindling her love of baking and discovering that making bread possesses an unexpected healing power. 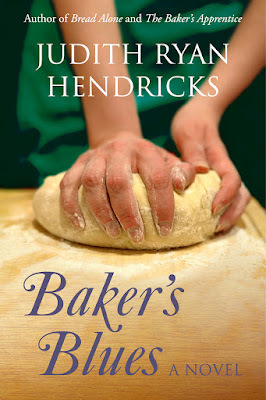 Bread Alone is one of my favorite novels, and for years I've been anxiously awaiting (and pestering Judi about) the publication of part three of this bakery trilogy, Baker's Blues. This new book is just as good—and just as food-filled—as all of her others, and I've already read it twice. Baker's Blues can be read on its own, but you'll enjoy it much more if you read Bread Alone and The Baker's Apprentice first. I'm so happy to be kicking off this 19-stop TLC virtual book tour for Baker's Blues with an in-depth interview with Judi, recorded during one of our marathon phone chats. Read the interview below. . .